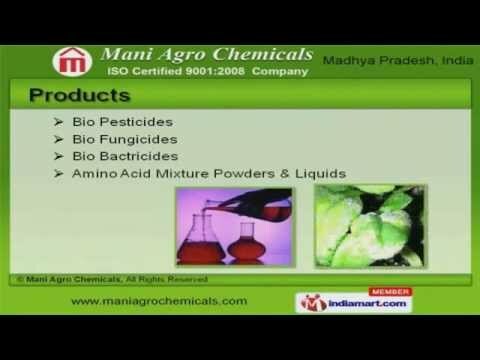 Welcome to Mani Agro Chemicals, Manufacturer and Exporter of Chemical and Stimulants. We are an ISO 9001:2008 certified company, established in 2010, at Indore. We have spread our wings to Indian Subcontinent and East Asia. Customized solutions, free sampling policy and variegated payment options make us the first choice of our clients. We offer a splendid range of Bio Pesticides, Fungicides and Bactricides. Our Nitrobenzene Emulsifiers and Potassium Humates are best in the industry amongst others. We offer Seaweed Extracts and Humic Acids that are extremely reliable. Wetting and Spreading Agents offered by us are available at industry leading prices. Along with that we offer Bio Organic Fertilizers and Metal Sulphates that are widely acclaimed in the market. We also provide Agricultural Spray Adjuvants that are one of the best in the market.